Yeah I know the title looks awkward and seems impossible too but here is a creative blogging tips to do that I was monitoring some of my fellow bloggers website and suddenly one thing shocked me. Few high PR and Alexa rank blogs were giving direct backlinks to the low Alexa rank blog and I tried to figure out that what is the reason behind that. Here in this post I will share how to get backlinks from your toughest competitor or even enemy blog and it is possible too I will show you proof too. And share these marketing strategy how they got backlinks from high PR blogs. So without discussing too much I directly come to point that how they got backlinks. Below we will discuss about how you can get backlinks from sharing your competitor's video series, instagrams, interviews and mentioning them in your website. The logic is simple to get backlinks from your competitor's website. First go to YouTube and type the name of that website or admin of that blogger now get embedded code of all of his videos and insert them in your blogger or website page or in a post. YouTube videos embedded code has many options like you can re-size them so reduce the width and height of all videos because you are going to show all of them in one page. And then insert them in table code and arrange it according to your website or blogger layout. And many others depending on type of videos. And now again ask for a link from that admin. I have seen it working as far as concerned about my blogs. I have been running 12 blogs and many of my blogs got success and backlinks from this strategy. So one thing is sure it works and if it does not work then you have the option to remove it. Well this is the one way you can get backlinks or says direct natural links from any successful or high PR website or produce great content and wait for natural links coming to your website. Which happens very rarely. So the choice is yours what to do or what not to do. If you are reading this post that means you are curious about increasing your blogger blog links or exposure now tell me to how many websites you have given direct or natural outgoing links. Did you ever give backlinks to your competitor's blog. NO - ANSWER IS NO BUT WHY? THAT WEBSITE HAS GREAT CONTENT. So logic is simple no one gives direct links or very few does it. So creating great content and waiting for the natural links is tough so share videos at least you have a success ratio of 85%. How an interview can give you lots of backlinks and new blog post ideas. I have written a great post about this trick to get natural backlinks and enormous traffic from any successful blog. I have done this trick for my other blog and in the company's projects where I work. I just smartly divided an interview into 3 parts and titles were like anyone had to click on those links after reading the titles. So how I did that for my client websites and blogs. You can know it in detail on here. Instagram are gradually becoming more famous day by day. So how it can help you to get backlinks from your competitor blog or website here is the trick. If you see closely very few blogging related websites are using instagrams so collect all of their instagrams along with other websites instagram and post on your website and then ask for your admin to give you link . Important Conversation Tips With ADMINS. Now here is the point 50% of the work depending on how you talk and what type of words do you use in conversation with your admin. Show them your website status only if it is good otherwise do not mention it. Another way to get backlinks from your competitor's website or blog is through by guest posting. Now a day it is too common and mostly backlinks coming though guest posts are "no-follow". So it has no sense until it is do-follow. But in the end link is a link so people do guest posting. You can also use guest posting but not all of the blogs allow guest post . And content should also be high to get approved. If you have such quality then go for guest posting or use the above methods to get success in natural links. Well here we discussed blogging tips to get natural backlinks from your competitive blogger blog or website through doing tricks with videos, interviews, instagrams and guest posting. These are all blogging tips and tricks for few it works and for some unlucky person it does not. Do it if you like or leave it the choice is yours. If you like these tips then be my friends on Facebook and Twitter and then we will share each other's content. I will share your content in my large circle and you can also do the same. 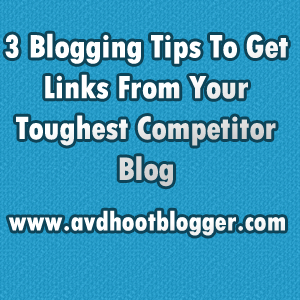 Description : 3 Blogging Tips to get natural backlinks from toughest competitor blog or enemy blog.seems impossible but the best way to get backlinks and traffic that forces your competitor for giving links.